This 2 dimensional model helps us figure out where we should invest our time and energy. Marketers will often favor the “N” strategy. They'll spend the majority of their time furthering the relationship with people who already like their brand to first leverage endorsements by influential evangelists and then try to turn super fans into influential evangelists and develop fan communities. Many service providers have played along to help brands better organize and measure their advocacy programs. And even though such programs are compelling for marketers and senior execs — because they reflect and amplify how great the brand is — they are rarely effective. Artificially increasing the influence of fans starts from the wrongful premise that what they need to be influential is a bigger microphone. For sure, brands can amplify a positive signal from these fans but besides increasing the chatter within a fan community already convinced of the virtues of the brand, how does this really move the needle for the brand? Crafty marketers however will favor the “S” strategy to advocacy. They’ll nurture their influential evangelists who will in turn take care of communicating to their fans (in a much more effective way) but then quickly move to engage influential detractors and those who don’t know about their brand yet. Why? Because this is where they can gain the most ground and make the biggest difference. And while it can be uncomfortable to marketers to engage with influencers who don’t like their brand or don’t know it exists, turning detractors into effective evangelists is much more realistic than turning fans into influencers. Be authentic: don't hide behind a corporate handle, engage with them personally. Show empathy: understand and respect their viewpoint, don't just give them the company's party line. When you do, you'll quickly find common ground and create a space for a constructive debate. 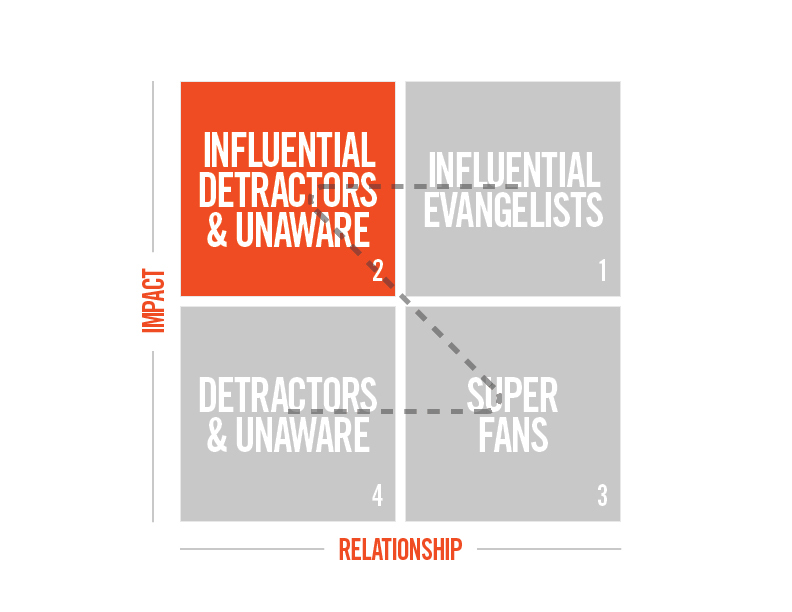 Build a virtuous circle: influencers, like the rest of us, get influenced. If you can't get through to someone, reach their influence network to build awareness and positive brand perception. Love your detractors & show altruism: the hardest thing for marketers is to set aside their tactical goals when engaging with influencers. It is however the only path to success. Unless you genuinely work towards making their life better without expecting anything in return, all your conversations will be loaded. Porter Gale said it best: "Give Give Get". The reward for your efforts? A dramatic increase of positive influential conversations and access to new communities through these influencers that you may have not touched before.